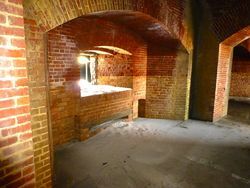 Fort Massachusetts (1) (1859-1875) - Construction began in 1859 as an unnamed Third System brick fort and was incomplete when the U.S. Civil War began. 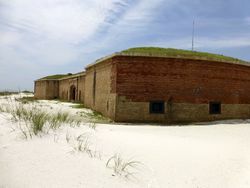 The fort was located on Ship Island in present day Harrison County, Mississippi. Taken over by Confederate troops 20 Jan 1861 and named Fort Twiggs for Confederate Major General David E. Twiggs. In September 1861 Union troops reoccupied the fort. The last military units left the fort in 1875. The Fort was not referred to as Fort Massachusetts in official correspondance until 27 Jun 1884 and that name was never officially given by a War Department General Order. Also known as Fort on Ship Island and Fort at Ship Island. 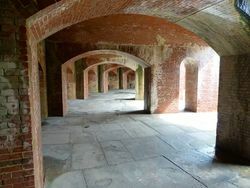 Fort Massachusetts Interior from the Barbette Tier. Note the Circular Stairs in the Center. Construction began in March 1859 on the brick "D" shaped Third System fort and slowly progressed until the beginning of the U.S. Civil War. The progress of the fort is displayed in the color of the brick in the walls. "Grey" brick from Louisiana was used before the war and rises some 3 feet along the curved wall. "Red" brick from Maine was used during the war and rises to the top of the casemates. The brickwork on the Barbette tier resumed the use of Louisiana "Grey" brick after the war. The U.S. 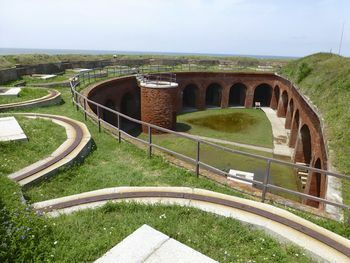 Corps of Engineers completed the fort in 1866. The completed fort contained a single layer of casemates and a barbette tier. Three circular staircases connected the parade level to the barbette tier. Four magazines on the Barbette tier serviced the Barbette guns. Two magazines on the parade level serviced the casemate guns. A hot Shot furnace was placed on the parade. Two half bastions flanked the single sallyport with guardrooms on either side. The Fort was designed for 37 cannons but only 17 were mounted, thirteen 10-inch Rodman Cannons in the casemates, two 15-inch Rodman cannons in the demi-bastions and two 100-pounder rifled Parrott guns over the sallyport. All of these were mounted in 1866 after the U.S. Civil War. 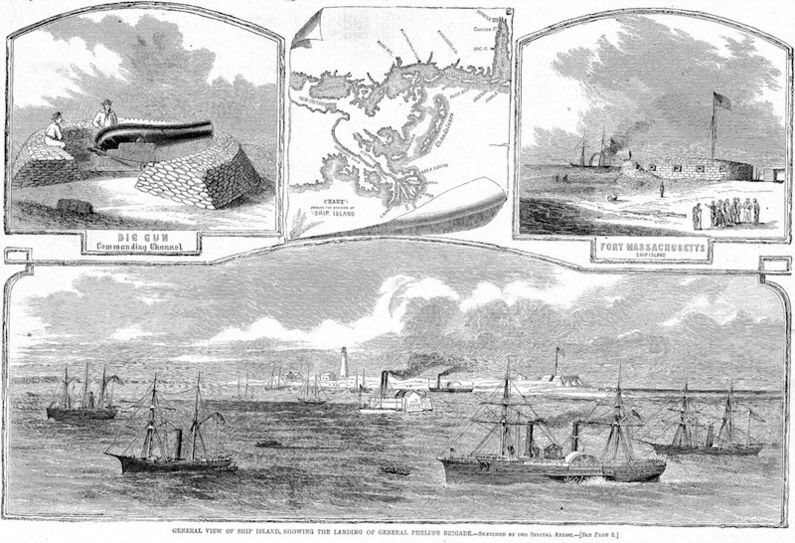 After the recapture of Fort Massachusetts by Union forces in September 1861, Ship Island was used as a springboard for the Union capture of New Orleans in 1862. Union ships used the island for repairs and to pick up supplies. Almost 40 buildings were constructed on the island during the war including a hospital, barracks, a mess hall, and a bakery. As many as 18,000 Union troops were stationed on Ship Island during the war and it housed as many as 4,430 Confederate prisoners of war during 1864 and 1865. Upon completion, the fort was turned over to civilian fort keeper C. H. "Pop" Stone who was to maintain the fort in a state of readiness. 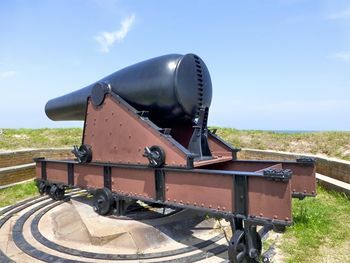 When cannons were mounted, an ordnance-sergeant was assigned to care for the fort's armament and he eventually assumed all responsibility for the upkeep of the fort. The last ordnance-sergeant was relieved of duty in 1903, and the Ship Island lighthouse keeper became the fort's caretaker. Must See Fort! Part of the Gulf Islands National Seashore, Ship Island, Harrison County, Mississippi. 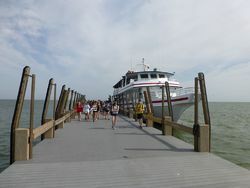 Access by boat with seasonal service from Gulfport. A 15' Rodman Smoothbore Cannon is located in the north bastion and pieces of a second 15" Rodman Cannon located in the south bastion. Fragments of other cannons can be seen in various positions including the 100-pounder Parrott rifle positions. Speer, Lonnie R., Portals to Hell:Military Prisons of the Civil War, Stackpole Books, 1997, Mechanicsburg, PA, ISBN 0-8117-0334-7, 410 pages, page 330. This page has been accessed 16,346 times. This page was last modified 10:28, 16 April 2019 by John Stanton. Based on work by jay atwood.